If the home building industry had a “triple threat,” Amy Dutton would be it. 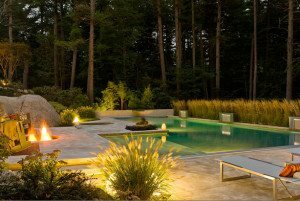 Her Maine-based design studio offers not just interior design, but full-scale architectural and landscape design services, too. All are done by Dutton, and neither she, nor her clients, would have it any other way. Although some of Dutton’s clients engage her for the full scale of her services at the get-go, oftentimes, smaller jobs snowball once her clients realize they can get the entirety of their renovation needs met under one roof. Such was the case when a Chelmsford, Massachusetts, family reached out to Dutton about modernizing their York Beach cottage. The homeowner initially asked Dutton to oversee the interior materials and read the architectural plans, but the conversation quickly escalated. “I saw that there was room for improvement, so we took over architecturals and revised the plans pretty significantly,” Dutton says. Dutton’s reimagined design gave the house a second floor, an addition, and a brand-new layout, while honoring the client’s desire to maximize the home’s views and maintain the original footprint. Taking into account the addition, Dutton finished off the landscape with shrubbery designed to add privacy while blending the architectural elements with the outdoors. Inside, the clients wanted to maintain the integrity of the home’s seaside locale, and tasked Dutton with creating a light and airy beach cottage. “It was lots of light colors, and a lot of wood, and wood beams,” the designer says. But that also meant instilling a feeling of serenity throughout the home. “The cabinetry part of this project was really interesting and in-depth, because they wanted all appliances and TVs hidden,” says Dutton. “I think there are 9 Sub-Zero and Wolf appliances in the kitchen, and most of them are paneled. There are also five TVs hidden throughout the house. Over the fireplace there is a mirror that flips around and becomes the TV, and in their bedroom we had a custom piece of furniture built and the TV just lifts out of it.” In case there’s any question, Dutton custom-designed the cabinetry, too.